Tags: Holy Mother of Pearl! With the Frigo Bridge out this bridge is handling 30-40 thousand additional cars per day. I could have told you that just based on the sound level down below. I was down below my favorite bridge yesterday morning. This is the 172 Bridge, sometimes referred to as the Allouez-Ashwaubenon Bridge, and it spans the Fox River as one of the two major traffic-carrying bridges in the area. I like these slices. I finished them softly to evoke a cathedral or sacred space feeling. 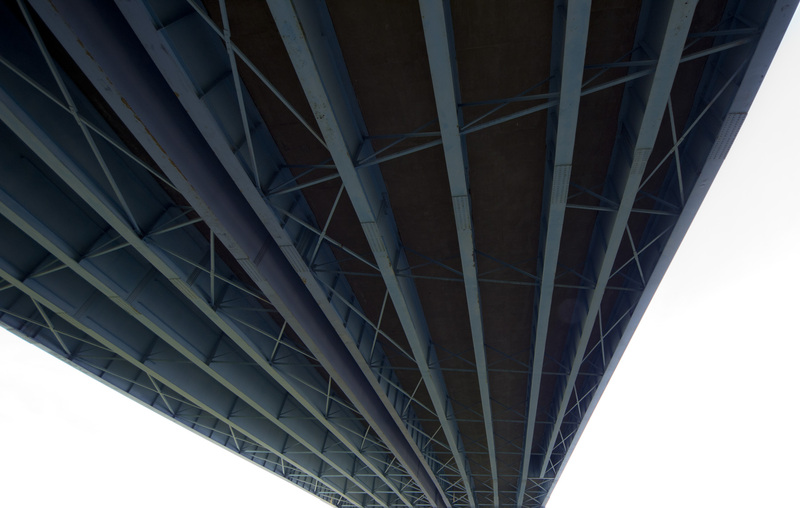 Next, the underside of the roadway, taken a little right of center and using a Sigma Ultra Wide lens. By cropping the support structure out, I was going for a high speed power blast. And, as long as I was down there, why not finish with a nice slice of graffiti?